Laurie Childree’s second collection of piercing poetry pays homage using the other side of a coin from her vivid world. 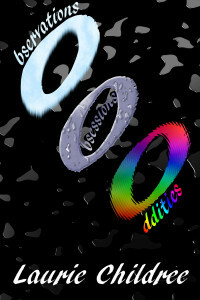 Observations Obsessions Oddities bears the hallmark of her keen grasp on the world and her place in it. True to the title, Childree offers up observations of life with her signature direct style. In chapters titled Life, The Mundane, Irritants, Observations and Appreciate she brings us full circle from a macroscopic view into acute awareness of single situations. Laurie never shies away from pain or struggle, as is evident in her poetic pleas from child abduction all the way to tempest storms. Her poems obsess about becoming self-sufficient and breaking out of mundane obligations into financial independence. With an aesthetic of a broad brush stroke coloring our vision with her tactile texture, Laurie Childree guides a dramatic foray with signature verse.